Sciatica is a health condition involving injury or compression of your sciatic nerve -- the longest and thickest nerve in your body. If you have sciatica, you likely feel pain or other sensations along the distribution of your sciatic nerve. Leg pain, tingling, numbness and weakness are symptoms of sciatica. Speak with your doctor about diet and nutrition-related topics before using certain natural foods to help treat your sciatica. Numerous health problems can cause sciatica, such as herniated discs in your lumbar, or lower spine; lumbar spinal stenosis, or narrowing; pregnancy; scar tissue; tight muscles; sacroiliac joint dysfunction; degenerative disc disease; tumors; and infection. In most cases, sciatica causes symptoms on only one side of your body. Sciatica-related pain is commonly described as burning or shooting, and it can make walking and other activities of daily living difficult to perform. Because many cases of sciatica might be caused by piriformis muscle spasms, an effective dietary approach involves increasing your consumption of magnesium-rich foods. Your body requires magnesium to help release muscle contractions. Magnesium-rich foods include dairy products, fish, meat, seafood, apples, apricots, brown rice, dulse and lima beans. 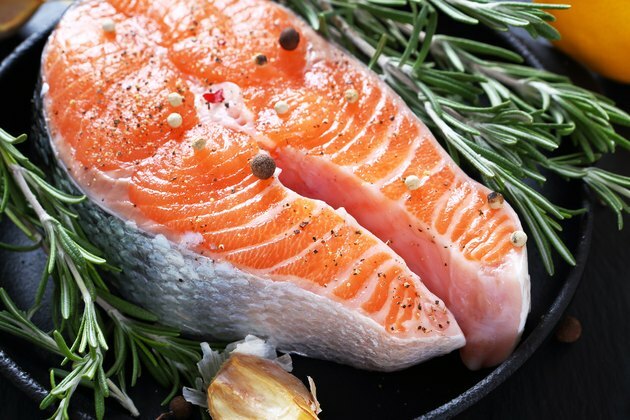 Foods containing significant amounts of vitamin B-12 -- liver, clams, oysters, lamb and cheese -- also might be beneficial in treating your sciatic nerve pain. Halibut, a magnesium-rich food, might be helpful in treating your sciatica, especially sciatica associated with tight muscles or muscle spasms. Halibut contains numerous other nutrients, including tryptophan, selenium, phosphorus, magnesium, protein, omega-3 fatty acids and vitamins B3, B6 and B-12,. The relatively high vitamin B-12 content in halibut might also help reduce your sciatic nerve pain. Halibut also has traditionally been used in treating cardiovascular problems, such as heart arrhythmia and elevated blood pressure. Sciatica is a symptom, not a disease. If you experience sciatic nerve pain, an underlying health problem is causing your symptoms. In some cases, sciatic nerve pain might be caused by a serious health problem, such as a tumor. If you develop sciatica, consult your doctor as soon as possible. Your doctor can order relevant tests to help determine the true underlying cause of your health complaint. More research might be needed to confirm the health benefits of foods historically used in treating sciatica.